XfrogPlants Basic: Now Free with Xfrog 5! Get 60 free 3d plants with any purchase of Xfrog 5 software: Xfrog 5 for Maya or Xfrog 5 for Cinema4D. Like Xfrog 3.5 Full and Lite, Xfrog 5 now includes our popular XfrogPlants Basic library, free! Get started with 60 high quality 3d tree models featuring 20 of the most common species of trees from around the world. Each fully textured tree includes 3 variations in age and shape. 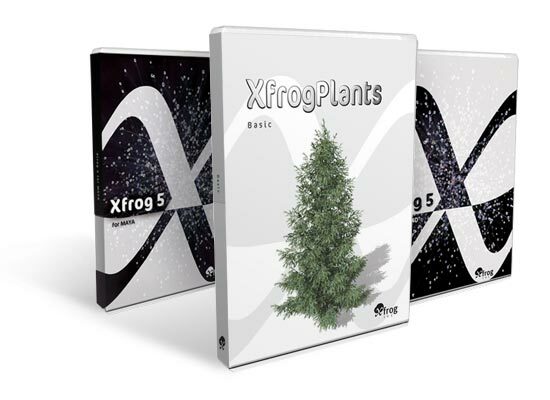 If you purchased Xfrog 5 after May 1, 2012 and did not receive XfrogPlants Basic, please contact registration@xfrog.com with your order number, and we will send a download link for XfrogPlants Basic. This entry was posted on Friday, July 27th, 2012 at 4:03 pm	and is filed under Press Releases. You can follow any responses to this entry through the RSS 2.0 feed. You can leave a response, or trackback from your own site. What about those of us who already bought Xfrog 5? Is there some way we can receive the Basic Library? Excellent question. I have updated the post: we will issue download links to any customer who purchased Xfrog 5 in the last 3 months (May 1 or later). Does Xfrog 5 for Cinema4D support the older Cinema4D v.10 Version? Unfortunately, no. Xfrog 5 requires Cinema 4D R12 or newer. If you order Xfrog 5, with the Basic library, we can give a key for an older version that will work with your version of C4D (I believe that would be Xfrog 4.3). If you upgrade your copy of C4D, we will update your version of Xfrog to version 5. We have 30 day trials for Xfrog 5, Xfrog 4.4 and Xfrog 4.3 for C4D on the Xfrog 5 product page.